I have always been both foodie and self-confessed bookworm and I feel a strange tingle of delight when I stumble across instances of these two areas overlapping. As in the first case where food arguably forms part of one of the most-oft repeated tales of all time. Ditto for Ameen's book featuring the very same dish. You can imagine my delight then when I became aware of a blogging event that celebrates this partnership of good food and good books. Starting this month, I will be diving into Garlic & Sapphires by Ruth Reichl in preparation for my very first challenge of This Book Makes Me Cook. The basic premise is that all the participants read a specific foodie novel which will then serve as inspiration for a recipe to blog about. If you are a fellow book & food nerd, I am sure you will need no convincing to dive in with me. Coming back to the dish that launched a thousand novels (almost), Mujadarra happens to also be perfect for Meat-Free Mondays. Not only that, but it is super versatile to boot, as you can served it both as main or side-dish, hot or cold. Some might say Esau was crazy, but I'm telling you, the man was onto a very good thing when he made that life-changing trade. 1. Heat half of the oil over medium-high heat in a medium-sized frying pan. Add one onion and fry for a few minutes or until softened. 2. Transfer onion to a pot, adding garlic and spices and fry for a few seconds or until fragrant. Add lentils and rice, stirring to coat with the oil and spices, then add water, salt and pepper and bring to the boil. Reduce heat, cover and allow to simmer for about 30 - 40 minutes or until cooked through. Add lemon juice, stir through, taste and adjust seasoning if necessary. 3. Meanwhile, heat the remainder of the oil in the frying pan yo used previously, then add remainder of onions with a touch of salt and allow to caramelise over low-medium heat. This will take roughly 30 minutes as well. 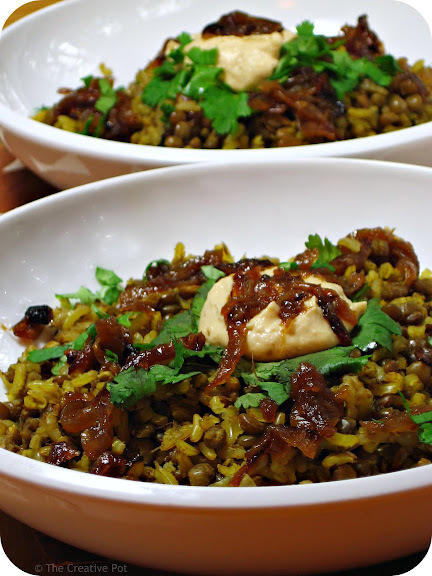 Spoon rice and lentil mixture into serving bowls, top with caramelised onions, hummus (if using) and fresh coriander. Serve immediately. When I was in Israel it was one of the favourite dinner dishes that I made for the commune I stayed in, I tended to make it as a side dish with chicken schnitzel and it was good enough for the vegetarians there to just eat a bowl of that alone so no need to make anything extra for them. LadyRaven - Thanks for sharing some of your favourite ways to eat Mujadarra - will definitely be trying this with the pasta rice as well. 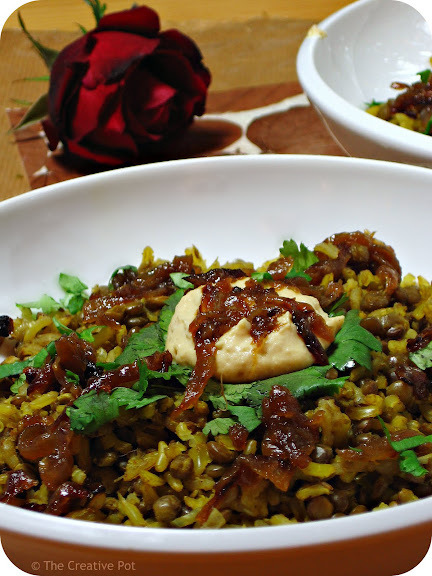 Between the lentils, caramelized onions and awesome Middle Eastern flavors. I might sell my birthright for this dish. I think Esau was totally onto something. I love the idea of cooking with reference to a book! I'm a total bookworm, and find myself salivating for dishes cooked in the books I read, what a brilliant idea! And this dish looks just divine, I love caramelised onions! This is such a interesting recipe. Love the combination of flavors and I'll definitely give this a try! Oh wow...this is a super recipe! I simply must try this one! I keep seeing recipes for this stuff, it calls out to me. It's great that you also found This Book Makes Me Cook! I loved Garlic and Sapphires, looking forward to see what you thought of it. Zabwan - If you love lentils, you'll definitely love this. Joanne - Esau was a visionary it would seem. Or maybe the world's first foodie? Polkadotcupcake - So looking forward to whipping something up inspired by a novel! Magda - It's such a simple combination of flavours but it comes together beautifully. Trish - Thanks! Hope you enjoy it. Adele - I actually found the event through your blogpost about Julie & Julia! :-) Almost finished with Garlic & Sapphires, but finding it hard to choose something to cook. I am always on the lookout for lentil recipes - I love them but hubby gets bored if I don't find new ways to make them!! I LOVE the flavours in this dish - definitely going into my bookmarks folder. Cherine - Thanks, it's nice to have you here! Jeanne - Think hubby will like this one; it's very versatile too, think you'd be able to serve this with almost anything. Souldiaries - Thanks for the great tips; will definitely try with tahini and fish in future. living in zanzibar, spice island! 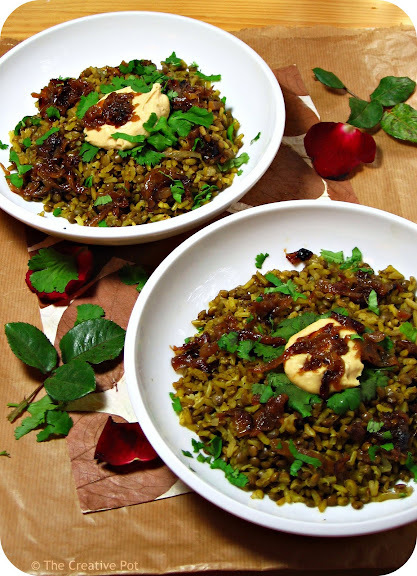 tried this recipe for iftar and we absolutely loved it! yum! the caramelized onions are divine, divine. i added a dollop of yogurt with chopped mint and garlic, with a side salad (chopped tomatoes, coriander, lettuce, cucumber, and onion, dashed with cumin, salt, and lime (can't find lemons here). thanks for posting this, lentils here are abundant and was happy to switch it up from the classic lentil/carrot soup story. asante sana! Amanda - Wow, so jealous of your location! Would love to visit Zanzibar one day. Glad the recipe worked out so well for you. Can imagine the herby yoghurt would've tasted very good with the mujadarra. I made it with short-grain white rice. Turned out lovely. Next time, I will try brown rice.